A Dentist in Orange Park Says Not to Grieve Over Dead Teeth! Avoiding the dentist for tooth pain is never a good choice for your dental health. It’s even worse to ignore the physical signs of dental issues. Your oral health could really be in jeopardy. What options do you have once you’ve realized you have a dead tooth? Your dentist in Orange Park can help you understand why a tooth may “die” and how to help a dying tooth. When you look at the anatomy of a tooth, you can dissect it and see at least 3 layers: tooth enamel, the dentin, and the pulp. The tooth pulp is the innermost layer of your tooth. 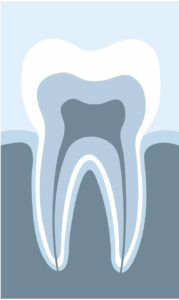 It holds the blood vessels and nerves of your teeth while being protected by your crown and gum line. When faced with any of these symptoms, you need to seek assistance from a dentist right away. Here are a few options your dentist may discuss with you. Your dentists first option will always be to save your natural teeth. One of the best procedures you can undergo to remove infection is root canal therapy. Don’t worry, your dentist will make your procedure comfortable both during and after with prescribed medications to alleviate any anticipated pain. During your procedure, your dentist will remove the inflamed and infected root of your tooth. After cleaning the infection out of your teeth, your dentist will fill the inside of your tooth with a rubber-like dental material to avoid future infections from taking place. Finally, your dentist will then seal your tooth and cap it with a dental crown. This will help to protect and re-stabilize it. Infected teeth are extremely dangerous and contagious to the rest of your teeth. Once a tooth root becomes contaminated, it will spread to neighboring teeth and damage the rest of your smile. Okay, so your tooth gets extracted…now what? Many dentists offer modern tooth replacement options for patients: dental implants. Thankfully, dental implants replicate the entire structure of a tooth, preserving and encouraging the growth of new bone tissue. Dental implants can help to rejuvenate your entire smile from root to crown with an implant post, abutment, and dental prosthetic of your choice. Consult your dentist to find the best dental prosthetic for you. After completing a one-year fellowship in prosthodontics at the University of Florida, Dr. Nawrocki furthered his training by completing a three-year residency in prosthodontics, receiving a specialist certificate and master’s degree in dental science (MS). With this extensive experience and continued education, Dr. Nawrocki is the best dentist to turn to with dental pain. Feel free to call (904) 272-1588 to schedule an appointment. Comments Off on A Dentist in Orange Park Says Not to Grieve Over Dead Teeth!